Mission Foods “New Year, Better Choices” Sweepstakes – Win a fitness tracker! Win a fitness tracker (11 winners)! ENTRY LIMIT – Entry Limit: one (1) entry per email address per day. ELIGIBILITY – The Sweepstakes is open to legal residents of one of the 50 states of the United States or Washington District of Columbia (D.C.) who are age of majority (age 19 in Alabama and Nebraska, age 21 in Mississippi and age 18 in all other states and D.C.) or older. 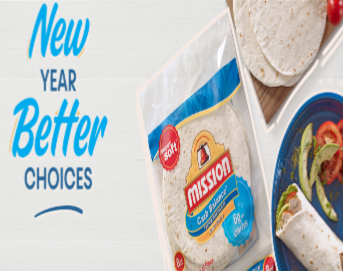 SWEEPSTAKES ENTRY PERIOD – Mission Foods “NEW YEAR, BETTER CHOICES” Sweepstakes begins at 12:00:01 a.m. Eastern Time (“ET)” on January 1, 2019 and ends 11:59:59 p.m. ET on January 31, 2019. PRIZES – Eleven (11) Grand Prizes: each, a fitness tracker wristband. Approximate retail value (“ARV”): $149.95 each. Ten (10) First Prizes: each, one (1) pair of wireless headphones. ARV: $40.00 each. Ten (10) Second Prizes: each, an 18 oz. double-wall vacuum insulated bottle. ARV: $30.00.